Powers/Abilities: Andromeda has superhuman strength, allowing her to lift (press) 14 tons in air. She is stronger than the average Atlantean male. While she normally cannot survive out of water longer than 10 minutes, she has at times used a serum that gave her the ability to absorb oxygen through her skin. This serum also caused her skin to turn Caucasian. She is an extremely quick swimmer, also greater than the average Atlantean. She is well-versed in most Atlantean combat methods. After the Vishanti combined Andromeda's form with Genevieve Cross, Andromeda and Genevieve took turns possessing the body, subverting the other's will and form. History: (Iron Man Annual I#10/2 (fb)) - Andromeda was born to Attuma and Lady Gelva, and was Attuma's eldest child. (X-Factor Annual I#4 (fb)) – Attuma was ashamed to have a female as his firstborn and quickly cast her aside. Andromeda was raised as any male Atlantean child would be. She was trained to fight, hunt, and kill. (Marvel Comics Presents I#121/4 (fb)) – As a child, Andromeda was taught in the ways of an Atlantean soldier. She learned respect, duty, trust, and dedication. She played often with her friend Nautak in the kelp fields. She was still in training when Namor led his first attack against New York City. (Iron Man Annual I#10/2 (fb)) - Attuma eventually lost touch with Andromeda, and no longer knew what became of his daughter or even if she still lived. ((New) Defenders I#149 (fb)) - Andromeda always wanted to be a soldier. She worked hard to become a decorated commander in the Atlantean army, and developed a reputation as a savvy fighter. (Marvel Comics Presents I#121/4 (fb)) - Namor bestowed a special tiara on Andromeda as a testament to her bravery, and granted her a prestigious position in the Atlantean military. ((New) Defenders I#149 (fb)) - After being denied several career opportunities and military honors because of her gender, Andromeda grew frustrated and resigned from her position. Having heard of Namor's experiences with the Defenders, where men and women adventured equally, she decided to seek the team out. She spent months learning surface culture, 'boning up on surface mores, idioms, and styles until [she] could tell the difference between Nike and Adidas,' and then put together a plan to infiltrate the surface and find the Defenders. She got an oxygen mask (designed by Warlord Krang) that would turn her skin color Caucasian, and utilized a serum that would allow her to breathe surface air. ((New) Defenders I#143) - Andromeda, in Caucasian skin and a jogging suit, docked her submarine and went jogging on the surface world. When she fell, another jogger, Tony, offered to help her. He took her back to his place because she didn't have any money. ((New) Defenders I#145) - Andromeda, using the cover name Andrea McPhee, stayed the night at Tony's. He came home from work, and she lied about why she was still there. While he told her about his day, she stole his wallet and duplicated his credit cards and IDs using a remote-controlled aerial machine she had placed outside the window. When he noticed her lips turning blue, she ran into the other room and used a special apparatus to make her skin Caucasian again. She flirted with Tony to distract him. ((New) Defenders I#146) - Days later, Andromeda and Tony went out to a nightclub. Hotspur came in and enticed the crowd to dance, and she and Tony hit the floor dancing. With the crowd caught up in Hotspur's spell, the villain began slashing people with his claws and none of them seemed to notice. Andromeda, unaffected possibly due to her Atlantean nature, attacked Hotspur with a blade when Tony got hurt. The crowd began cheering Hotspur on in the battle. When Hotspur broke his claws on Andromeda's stomach, he fled. She pursued Hotspur out into the street, threatening to kill him as she had so many enemies in the past. When Hotspur hit Andromeda with Muspel-flame (soul-fire) Andromeda was distracted, and Hotspur escaped. Tony came outside and realized he was bleeding. As they walked away, Andromeda vowed to apprehend Hotspur. ((New) Defenders I#149 (fb)) - Andromeda left Tony a large pearl to repay him for his troubles, then went off to find Hotspur. 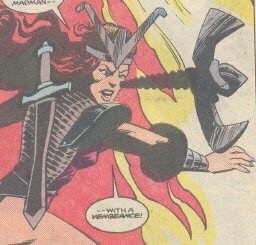 ((New) Defenders I#146) - Later that day, Andromeda, in full battle gear and with a large trident, interrupted a battle between Hotspur and the Defenders. ((New) Defenders I#147) - Andromeda got Hotspur in a headlock and accidentally broke his arm, but he quickly healed himself. Hotspur involved she and the Defenders in a mass hallucination that almost left them murderers, but Gargoyle shocked the other heroes back to their senses. Andromeda and Valkyrie held Hotspur while Gargoyle and Cloud caused him to experience mortal pain, defeating him. Seraph, an old Defenders ally, approached, ready to reveal Cloud’s origins. ((New) Defenders I#149) - Andromeda recounted her origins to the team, and was welcomed as a member. While investigating Cloud’s origins, the team headed to West Virginia and then to space. ((New) Defenders I#150) - In space, the Defenders teamed up with Seraph, the Xiombarg aliens, and the Cosmic Cube to battle the Star-Thief. After the battle, Cloud returned to space. During the battle, Andromeda’s battle prowess, ability to lead by command, and ability to see things in the murky depths proved valuable. ((New) Defenders I#151) - After seeing Seraph off, the team returned to Defenders Mansion and found Manslaughter there. Andromeda and Gargoyle freed a trapped Sassafras (the Beast’s dog), then Manslaughter ambushed them. Manslaughter placed a piece of desiccant tape over Andromeda’s mouth, and it drained all the moisture out of her lungs, causing her to collapse. Manslaughter then used Andromeda’s trident to stab Gargoyle’s hands to the wall. After the team regrouped, slightly recovered, Manslaughter set fire to the Mansion, but Interloper arrived and stopped him. Then the Dragon of the Moon, possessing Moondragon, attacked. ((New) Defenders I#152) - The Dragon of the Moon gave Andromeda the chance to flee, but she refused. While Interloper held the Dragon off, Andromeda held Moondragon’s body and Manslaughter fed madness into her mind. Moondragon and the Dragon fled, but later returned, even more powerful. Moondragon claimed to be free of the Dragon, and Andromeda wanted to kill her to be sure. The Dragon manifested again and took over Gargoyle’s body, mutating it. Andromeda fought the possessed Gargoyle, stabbing with her trident, and was thrown free. Interloper and Valkyrie used Manslaughter and Andromeda as mortal familiars, focuses for their immortal powers. The four of them gave up their lives willingly and defeated the Dragon in a mighty blast of power. The carbonized forms of the four of them, plus Gargoyle and Moondragon, blew away as ash on the wind. (Dr. Strange III#3 (fb)) - Andromeda, Valkyrie, Manslaughter, and Interloper did not die, but entered the Borders of the Land of the Dead, where the Dragon of the Moon enthralled all the other spirits against them. They spent what felt like an eternity battling the Dragon and his minions. (Strange Tales I#5/2 - 7/2) - When Doctor Strange made a pact with the Valkyrie, he gained the ability to summon the Defenders’ souls forth in battle on Earth, granting them life for a full 24 hours. He summoned them against Erlik Khan, who fled before the battle was complete. Later, they met Rintrah, Cloak and Dagger, and explained their origins. Nightmare attacked the team through Cloak’s cloak and pulled them into his dimension. After an ineffectual physical battle with Nightmare, Doctor Strange allowed the Defenders to return to “death,” in the other dimension. (Marvel Comics Presents I#37/3) - When Devil-Slayer entered the Borders of the Land of the Dead battling demons, he saw the carbonized forms of the four Defenders there. (Dr. Strange III#3) - When the Dragon found a way to reenter Earth, the team finally triumphed over the Dragon’s minions. The Vishanti granted them their wish to live again. Andromeda, manifesting as a supple otter, possessed the form of Genevieve Cross while her three allies possessed three other mortals. The four of them, along with Dafydd ap Iowerth and Doctor Strange, battled the Spirits of Air, Earth, and Water. (Dr. Strange III#4) - The group followed the Dragon of the Moon to the ruined town of Manchester, England. There they fought off men powered by the Dragon’s influence until ap Iowerth stopped them. They tracked the Dragon to a nuclear power plan next, and ap Iowerth drew the Dragon out of his mortal form. The five heroes attacked physically, then gathered in a circle. An enchantment by Doctor Strange christened the heroes as the Dragon Circle, giving them the power to keep the Dragon off of Earth forever more. (Iron Man Annual I#10/2) - Andromeda returned to Atlantis after learning that the Sub-Mariner was (presumed) dead and Atlantis was invading the surface world again under the orders of Attuma. Andromeda defeated the Atlantean soldiers who attacked her. Colonel Dakkor (an Atlantean soldier) pulled her aside and tried to quiet her words of rebellion, but she swam away to confront Attuma. She was brought before Attuma in a net, then released. She revealed that she was his daughter, and Attuma tried to kill her with his larger trident. Andromeda fled and rejoined with Dakkor, the both of them vowing to take Attuma down. (X-Factor Annual I#4) - One of the soldiers loyal to Andromeda brought her word that Attuma was leading an attack on a surface water purification plant. Andromeda led her charges into battle with Attuma's forces, but quickly swam off on her own to confront Attuma again. On the surface, she found the Beast, who was shocked to see her alive. When the Beast told her that Attuma was planning on mating with Marvel Girl, he and Andromeda went off to rescue her. They found Attuma there and Andromeda claimed the first-born's rite of challenge (a right only given to male children) and battled the more powerful Attuma, her trident against his sword. Soon after, Attuma knocked her out and prepared to kill her, but a mental projection of Lord Ghaur teleported Andromeda away, intending to make her one of the Seven Brides of Set. The Beast and Marvel Girl had already escaped. (Avengers West Coast Annual I#4) - Lord Ghaur put Andromeda in a trance alongside the other Brides of Set and prepared them for their upcoming wedding to the elder god in front of a group of Deviants. Andromeda and She-Hulk were sent to retrieve an artifact from an Atlantean site called 'the Altar of Neptune's Wrath.' When She-Hulk grabbed the artifact, several monstrous tentacles attacked her. Andromeda grabbed the artifact and returned it to Ghaur, leaving She-Hulk to fend for herself. The Brides watched as Ghaur used the artifacts to attempt to resurrect Set. When the Avengers attacked, Andromeda helped fend off Wonder Man. Set soon began rising again, and Andromeda looked on in wonder. (Thor Annual I#14) - Joined by Dr. Strange, Quasar, the Thing, and Thor, the heroes were able to repel Set while the Brides of Set watched, entranced. Ghaur quickly teleported himself and the Brides away. (Fantastic Four Annual I#22) - In a final bid to resurrect Set, Ghaur and Llyra loaded the Brides of Set onto a quickly spinning wheel with the intent of sacrificing them in order to achieve Set's resurrection. Several Earth heroes arrived, with the Sub-Mariner, and defeated Ghaur and Llyra, freeing the Brides and releasing them from their trances. (Marvel Illustrated: The Swimsuit Issue) - Andromeda participated in the Maria Stark Foundation's Super Olympics in a swimming contest, but lost against Namor. (Damage Control III#4) - Andromeda was one of many heroes gathered to oppose the cosmic threat of Edifice Rex, but Damage Control ended his threat by firing him. (Marvel Comics Presents I#121/4) - Still leading rebels against Attuma, Andromeda fought a battle against opposing forces led by Nautak, her childhood friend who had compromised his beliefs and joined with Attuma. She saved a female Atlantean citizen named Xiomara from Nautak by disarming him. Realizing they were fighting a losing battle, Andromeda ordered her forces to retreat, but Nautak's army collapsed a cliff on them and Andromeda fell unconscious. She awoke in an undersea cave, and was then hit with a paralyzing blast by Xiomara, who planned to use lethal force on Attuma's armies and didn't want Andromeda getting in the way. Nautak's forces attacked, and Nautak moved to kill Andromeda, taunting her. Regaining mobility, Andromeda killed Nautak with a blade. Realizing that her troops were headed for disaster, she picked up an Atlantean Horn in the vault and summoned an undersea Kraken to stymie Attuma's forces, causing both sides of the battle to retreat. Xiomara apologized to Andromeda. She broke the Horn before the Atlanteans. (Namor I#49) - When Namor, several Atlanteans, and several surface-men built Aquaria, an undersea base meant to support both human and Atlantean life, Andromeda led her troops to join them. The Atlanteans attacked, expecting that Andromeda's forces were led by Attuma. After the misunderstanding was cleared up, Andromeda asked Namor to reinstate her as his warlord. Namor, however, asked Andromeda to be his Peacelord, in charge of protecting Aquaria. (Namor I#52) - Namor took Andromeda with him to meet with Phoebe Marrs, where they learned that Attuma may have had involvement at Stonington Island in a mission to recover the USS Endurance. At the island, Andromeda was quick to defend Namor’s honor. She headed to Old Atlantis to decipher Attuma’s involvement, and found the city empty. In the throne room, she found Attuma defeated by the Sea Leopard, and she was soon defeated herself. Sea Leopard carried the unconscious forms of Attuma and Andromeda and challenged Namor to battle. (Namor I#53) - After recovering, Andromeda and Attuma joined forces and helped Namor against Sea Leopard. After an explosion left them stunned, they resumed battle. Andromeda took a blow to the chest from Sea Leopard’s tail, saving Attuma’s life in the process. After Sea Leopard was defeated, Andromeda refused an initiation to rejoin Attuma in Old Atlantis, so Attuma banished her. Andromeda helped Namor find the USS Endurance wreckage. (Namor I#55) - When Remora brought word that Tamara Rahn and Tiger Shark had been captured in Atlantis by Llyron, Namor and Andromeda went to investigate. Andromeda stayed back while Namor handled the situation. Namor was asked to leave Atlantis, and took his two captured allies with him. (Namor I#58) - Forming the temporary team of Deep Six, Andromeda joined with Tiger Shark, Tamara Rahn, Stingray, and Triton went out to find the missing Namor. They interrupted a battle between Namor and the Avengers, who thought Namor had launched another surface world attack. A furious Andromeda led a charge against the Avengers, but Thunderstrike's mace held her off. She tried to subdue the Vision, but he knocked her unconscious. In time, Crystal stopped the battle with a whirlpool. The Avengers, Tiger Shark, and Tamara Rahn departed, leaving the four remaining heroes to face the attacking Abomination. (Namor I#59) - The Abomination scattered the heroes, and knocked Andromeda and Triton's heads together into unconsciousness. Later, Namor asked Andromeda to find a cloaked vessel that had captured Stingray. Andromeda successfully found the craft and disabled its cloaking device with her spear. As the Abomination escaped, a small nuclear explosion went off stunning Namor and Andromeda and seemingly slaying Triton. (Namor I#60) - Namor drew the Orichalcum sword of Kamuu and he and Andromeda set off to find Triton, following the psychic impressions of sea creatures. They went on the surface of the Azores Islands, and Andromeda ingested her air-breathing serum. At a nearby research station, Bloodwraith attacked aboard his winged horse. Andromeda held back at Namor's request, and was knocked unconscious by a disguised Morgan le Fay. (Namor I#61) - When Andromeda recovered to find Namor dead from the Bloodwraith's ebony blade, his soul taken by the blade itself. She engaged in a sword-fight with Bloodwraith until her sword was shattered. A geyser granted her a temporary reprieve, and she grabbed Namor's blade, the sword of Kamuu. When Morgan le Fay (in her true form) appeared with a mutated Triton (alive), Andromeda was distracted and impaled on the ebony blade. In her last living moments, Bloodwraith's human side let Andromeda know that she could save Namor's soul if she would trade her own. Her body then shifted into that of Genevieve Cross's. Andromeda's soul found itself in the sword, where Namor did battle with an army of the dead. Andromeda revealed to Namor that Marrina (Namor's deceased wife) was controlling the army, information that Namor and Marrina used to escape the blade. Andromeda remained in the sword, willingly sacrificing her life so Namor could live. Back on the beach, Namor found Genevieve trapped in Andromeda's body, and shoved her head underwater so that she could breathe. (Namor I#62) - After Namor briefly battled Morgan le Fay, Triton, and Bloodwraith, he took Genevieve, in Andromeda's form, back to Atlantis, where Raman and Vashti got them medical aid. Genevieve was incredibly disoriented and unable to speak. Llyron approached them just before earthquakes hit the city and Atlantis was risen, killing sixty percent of Atlantis's population. Genevieve in Andromeda's form seemingly escaped. (Defenders II#2 (fb) - BTS) - Andromeda's spirit somehow escaped the Ebony Blade and returned to her body (or Cross's...it's not detailed). (Defenders II#2) - When Attuma and his forces attacked Atlantis, Andromeda fought alongside Namor, Namorita, and the Atlantean military. When Namor disappeared (due to the Defenders' curse), Attuma was able to take over the city. (Defenders II#11) - After weeks of being subjugated by Attuma’s forces, Namor and the Defenders (Dr. Strange, Hulk, Silver Surfer, Hellcat, Nighthawk, Valkyrie) finally freed Atlantis by defeating Deep Six (Attuma, Orka, Nagala, Sea Urchin, Tiger Shark, Piranha) and Attuma’s forces. Andromeda greeted Namor while the crowds cheered. Namor left Atlantis, and formed a Council of Three to rule in his absence. Namorita was appointed to speak for the royal house, Warlord Seth for the military, and Andromeda for the common people. It is unknown whether Genevieve or Andromeda was in charge of Andromeda's body at this time. (Thunderbolts I#57) - Andromeda got hiked up into the upper atmosphere by Graviton, just like almost every other superhero on Earth. (Thunderbolts I#58 - BTS) - Andromeda was lowered to the ground with the rest of Earth's heroes. (Fantastic Four I#578 (fb) - BTS) - Hearing about the rise of a new Atlantean city, from a group claiming to have been the original Atlanteans who had been in hiding for centuries, Namor sent Andromeda to investigate. (Fantastic Four I#578) - Andromeda and the Invisible Woman visited the Atlantean kings, and Andromeda questioned their authority. She let them know that when they were ready to show their faces to the world, then the true Atlanteans would address them. (Fantastic Four I#584) - Andromeda stood by with a group of Atlantean soldiers while Namor met the Invisible Woman on Utopia, as Cyclops and Emma Frost watched. Namor announced that he was ready to go forward and meet the kings in the Forever City. (Fantastic Four I#585) - The Invisible Woman presented Andromeda and Namor with the proposed treaty for negotiations between the races of the Forever City and the Atlanteans, including that each race would be allowed 12 soldiers during the negotiations. Andromeda shared concerns that the Atlanteans would be outnumbered three-to-one. When Namor conceded to the treaty, Andromeda shared her protests, but she was silenced with a glance from Namor and dismissed. Later, at the meeting with the kings of the Forever City, the Atlanteans proposed small territories for them to have access to, while the kings demanded a large amount of space, including access to Skarka (Attuma's lands) and access to the Grotto of the Ancients. Andromeda refused, restating her demands, and the kings followed with a vague threat of war. Namor responded by killing one of the kings, effectively declaring war. (Fantastic Four I#586) - After the murder of King Ul-Uhar, Namor led the Atlanteans, including Andromeda, into battle against the old Atlanteans while Namor's ships bombed the cities from outside. The Invisible Woman put up shields stopping the war and Namor and his men were taken captive to try and negotiate terms. (New Avengers III#9) - Thanos sent Proxima Midnight and her forces to raze Atlantis, seeking an Infinity Gem. Namor, Andromeda, and the remaining survivors kneeled before Midnight, telling her she could find her gem in Wakanda, who had been at war with Atlantis recently, bombing them savagely. (Infinity#2) - Proxima Midnight accepted the surrender of Namor and Andromeda. (Avengers VIII#9) - Namor recruited Andromeda to join his new super-team, the Defenders of the Deep, including Bloodtide, Echidna, King Crab, Manowar, Namor, Orka, Tiger Shark, and several mutated Piranhas. (Avengers VIII#10) - The Defenders of the Deep and War-Sharks saw Namor raise Hydropolis to the surface, then attacked the humans within, declaring that all on the surface world were no longer allowed under the ocean. The Avengers (Black Panther/T'Challa, Captain America/Steve Rogers, Captain Marvel/Carol Danvers, Ghost Rider/Robbie Reyes, Hulk/Jennifer Walters, Iron Man/Tony Stark, Thor/Odinson) attacked, and Andromeda and Manowar fought Captain Marvel. Soon the Winter Guard (Chernobog, Crimson Dynamo/Dmitri Bukharin, Darkstar/Laynia Petrovna, Perun, Ursa Major, Vanguard/Nikolai Krylenko, Vostok) intervened, and fights broke out among all three teams. In the chaos, Namor killed a few of the Piranhas for hunting humans, then he ordered the withdrawal of the Defenders of the Deep. The name Andromeda has its roots in Greek mythology, but this Andromeda obviously has no known ties to the Greek gods. 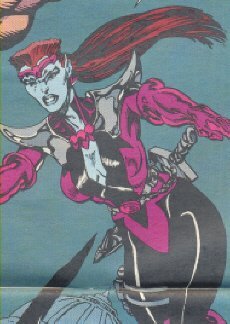 Andromeda was a character that came in very late in the Defenders series, like Interloper and Manslaughter, and all three were quickly killed and brought back. Andromeda became a much richer character once her connections to Attuma and the Atlantean military were explored later. For more information on Genevieve Cross, see the Dragon Circle profile, linked up at the top. Andromeda may or may not be dead at this point. Perhaps her connection to Genevieve, or the spell cast by the Vishanti, allowed her to return to life again. Andromeda had an entry in the Official Handbook of the Marvel Universe Deluxe Edition#1 and Master Edition#12. or anyone else not mentioned in this profile. ((New) Defenders I#143) - While jogging, Tony saw a woman fall and offered to help her. Because she didn't have any money, he offered to take her back to his place. ((New) Defenders I#145) - Tony spent the night with the woman (who said her name was Andrea McPhee, but was really the Atlantean Andromeda) and returned from work, pleased to still find her there. He talked about his dull stockbroker job, and said he'd make Andrea dinner. He noticed her lips had turned blue, and briefed her on proper running techniques. He was pleased when she flirted with him. ((New) Defenders I#146) - Tony took Andrea out to a nightclub and they started dancing when Hotspur enticed them to. Tony got caught up in Hotspur's spell and didn't notice when he was cut. When he came out of the trance, he went up to the street and found Andrea, who pointed out the blood on his cheek. They left for home and to rent a movie. (Iron Man Annual I#10/2) - When Attuma took over Atlantis and launched an attack on the surface world, Dakkor, of the Atlantean military, was afraid to start a rebellion on his own. When Andromeda returned, Dakkor warned her of the danger Attuma presented. The two of them left to start a rebellion together. (Marvel Comics Presents I#121/4 (fb)) - Nautak, an Atlantean soldier, often played with his friend Andromeda in the kelp fields as a child. (Marvel Comics Presents I#121/4) - Nautak changed sides in a bid for prestige and led an army for Attuma. He lead a battle against rebel forces led by Andromeda. He prepared to kill an Atlantean citizen, Xiomara, but was disarmed by Andromeda before he could do so. Nautak ordered his troops to fire on the retreating Andromeda and her forces, effectively collapsing a cliff on them. Nautak led a charge into an undersea cave that was a weapons stash for Attuma. Nautak fired at the army, then taunted the immobile Andromeda as he prepared to kill her. Nautak was shocked when Andromeda regained mobility and killed him with her blade. (Marvel Comics Presents I#121/4 (fb)) - When Xiomara's father was killed by Attuma, who had usurped the throne of Atlantis, Xiomara joined the rebels trying to retake Atlantis. (Marvel Comics Presents I#121/4) - Attuma's forces, led by a general named Nautak, attacked Atlantis. When Nautak tried to execute Xiomara, Andromeda (leader of the rebel forces) saved Xiomara. She wanted to kill Nautak, but Andromeda stopped her. When Nautak collapsed a cliff on the army, Xiomara fled and found a weapons stash of Attuma's. She drew forth a paralyzing gun and fired it at Andromeda, determined to use lethal force against the attacking army. When Andromeda summoned a Kraken to chase off the forces, Xiomara fled with the rebels. She later apologized to Andromeda for her rash actions.